There are some bands that mean more than others; both globally and personally. For me Guns N’ Roses were one of the most exciting bands on the planet. I saw them a number times in the early ’90s when I first discovered there were bands other than Queen (my first and biggest love). Nothing has come close to the feeling of anticipation I felt back in the day when waiting for a Gn’R gig. They lived and breathed rock n’ roll. They WERE rock n’ roll. Times change of course. I won’t retread old ground but suffice to say that Axl and Slash (with no small amount of help from Duff) have patched up their differences – or at least enough to get on the same stage. That there is no Steven Adler or Izzy Stradlin’ is a huge disappointment. A combination of not enough money offered (Stradlin’) and an injured back (Adler) seem to have put paid to their participation. The ticket price would suggest there is one particular reason for the semi-reunion; however it only works if it is worth the money. Bad reviews would kill a tour so they have to perform and perform they do. Guns don’t hang around. 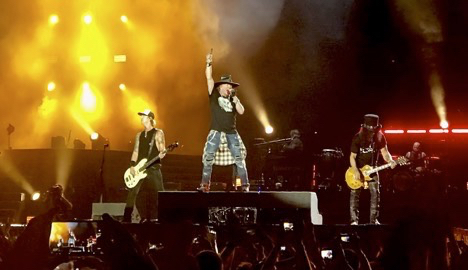 ‘It’s So Easy’, ‘Mr Brownstone’, ‘Chinese Democracy’, ‘…Jungle’ and ‘Double Talkin’ Jive’ (including Slash playing guitar with broken strings) open the show. The sound is outstanding. Axl’s voice is very good with just a few strains here and there but overall possibly the best he has sung in many years. The Gold Circle (the £165 including fees Gold Circle) we are in is full of people all ages. The crowd demographic is well mixed for a band 30 years in existence. Their music has passed the age and gender boundaries often found with a lot of their contemporaries. There are people here from 6 to 60 and all know every word. Soon things slow down with ‘Better’ and the massively underrated ‘Estranged’ before ‘Live and Let Die’ gets us moving again. Then ‘Rocket Queen’, and ‘You Could Be Mine’. There really are no low points. ‘This I Love’ is up next and is a bit of a mess in truth (so OK, maybe this is the one low point). Things go back to normal straight away though as ‘Civil War’ is another big, big highlight followed by a reasonable ‘Yesterdays’. ‘Coma’ is an absolute dream – it is 10 minutes of a musical masterclass that showcases the band in full (including possibly the best drummer I have seen play with Gn’R. I love Matt Sorum and Steven Adler but Frank Ferrer…WOW!). ‘Sweet Child of Mine’ has the crowd jumping, yes you have heard it a million times but it is an absolute classic. ‘My Michelle’ leads into Slash and Richard Fortus’ instrumental version of Pink Floyd’s ‘Wish You Were Here’, during which Axl’s piano gets set up. Axl then sits and plays the extended outro of Derek and the Domino’s ‘Layla’. Magnificent again. He’s a talented guy that Mr Rose. ‘Layla’ leads into ‘November Rain’ which is still one of the best rock “ballads” going. Then the crowd get to sing (shout) along with ‘Knocking on Heaven’s Door’. ‘Nightrain’ closes the main set and all I see are beaming smiles from every corner of the stadium – including on stage. The encore would be good anyway but hearing them play Soundgarden’s ‘Black Hole Sun’ we have another reminder of what Chris Cornell meant to the rock world. The Guns version of the song is a like for like cover. A wonderful tribute to a man who is sadly, badly, very much missed. Next up is ‘Patience’ which includes some impeccable whistling from Axl. Soon though, there is only one way to finish a Guns set; ‘Paradise City’. There is no getting away from it, that’s the song (as is the same I suspect for many others here) that got me into Guns N’ Roses. The video of them playing in the stadium, the look, the sound, and THAT chorus. Hey!, they mention pretty girls and green grass, what more could you want?! It brings a feeling of utter joy to me and those around me. A sea of smiling faces including a lot of kids (not rock chicks this time) on shoulders. There is a lot of love for this band. Satisfied? Absolutely, yes! It will never be the same as it was back in the day and until Izzy and Adler are on board it won’t be the full reunion. I fear that will never happen but if this is as close as we are going to get then that’s OK as on this evidence Guns are very much back in business.